Be Moved, Inspired, and Find Happiness. Thomas Jefferson wrote, “I cannot live without books.” Me too! I have bought, received, rescued, and read many books. I have over 1, 000 books. Growing up, I spent many hot summer days in Silas Bronson library, our town’s library. Deciding which books to read was not easy. I wanted to read them all. The maximum number of books I could check out at a time was eight so I took full advantage. I devoured them. They transported me to a life of characters, events, and imagination. They made me laugh, cry, dream, and wonder. Books have shaped me and continue to impact me. But I have three that have a special place in my heart. Paulo Coelho’s The Alchemist is a beautifully and simply written book. I picked up a copy at a then Border’s bookstore years after it was first published. I loved it so much I brought the Spanish translation. The Alchemist is even more beautiful in Spanish. I grabbed complimentary copies at a teaching conference and shared them with my students. I required The Alchemist in my listening/speaking class for international students. They had all read it in their native language and now were happy to discuss in English the protagonist — a poor shepherd boy named Santiago, his dreams, and the hardships and obstacles he encountered during his journey in search of his treasure. Betty Smith’s A Tree Grows in Brooklyn is another gem. I first saw the 1945 Elia Kazan film adaptation on the Turner Classic Movies (TCM). I fell in love with the movie and the story it told. I did not know the movie was based on a book. Years later I found a 1943 hardcover of A Tree Grows in Brooklyn in a pile of books a colleague discarded. I don’t know if it’s a first edition, but 1943 is the year it was originally published. Because it is in very good condition and I didn’t want to damage it, I bought a paperback version. I read it one summer as I swayed in the hammock underneath our maple tree. The movie, touching and heartwarming, made me cry; the book did the same. I see a lot of Francie — a poor twelve year-old protagonist with dreams of her own — in myself. A Tree Grows in Brooklyn takes me back to my childhood, my trips to the library, my love for books, and my love for writing. Francie loves to read and to write. The narrator writes, “Francie thought that all the books in the world were in that library and she had a plan about reading all the books in the world. She was reading a book a day in alphabetical order and not skipping….” Francie dreamed of having a desk, “shining yellow pencils for writing” and “books, books, books.” Francie also prays. She prays, “Dear God, let me be me something every hour of my life…let me be thankful…And when I sleep let me dream all the time so that not one piece of living is ever lost.” Francie was always dreaming, planning, and hoping. A Tree Grows in Brooklyn and The Alchemist reveal that one does not have to go to a faraway place to find happiness. Francie reminds us that little things like a library or “a place of shelter when it rains…or a book to read when you’re alone…make happiness.” Santiago realizes that the happiness he was searching for was right before him the entire time. Francie and Santiago represent the childlike awe and wonder that, even in difficult times, we should never lose. Both books offer hope, inspiration, and wisdom to help overcome life’s hardships, challenges, and adversities. These themes are also found in the Bible. The New Testament is home to the Pauline letters. One of my favorite letters is St. Paul’s letter to the Philippians. He writes this letter while in prison. Yet, his letter is full of hope and encouragement. Paul reminds us that even when life doesn’t go our way, God gets us through the good times and the bad times with great joy. His letters offer counsel on life and faith, and how to endure suffering and struggles. The Bible, home to the Gospels and to magnificent proverbs and psalms, offers encouragement and guidance. These books are sanctuaries. They guide us in times of adversity, uncertainty, trial and tribulations, and even joy, as we journey through our lives. 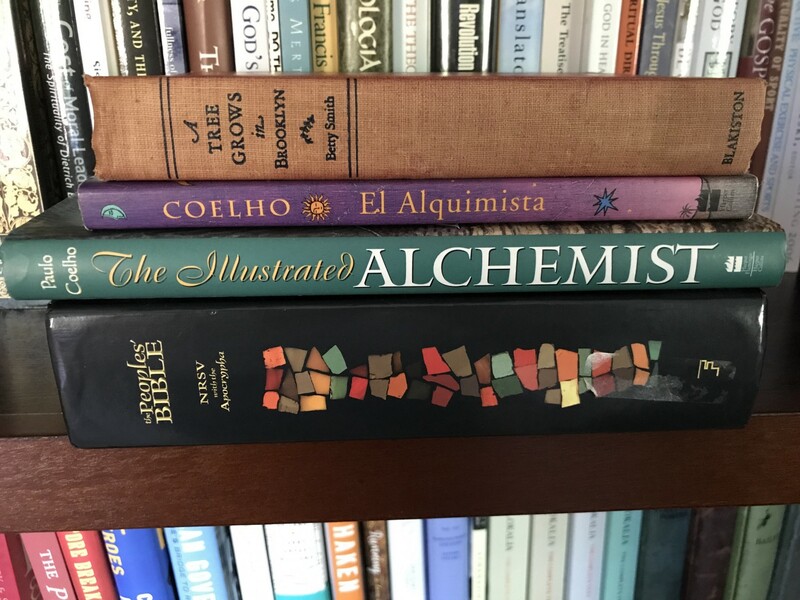 Of Francie, Betty Smith writes, “As she read, at peace with the world and happy as only a little girl could be with a fine book….” In The Alchemist Paulo Coelho writes, “God has prepared us for a path to follow. We just have to read the omens he has left for us.” I leave you with these great books. They leave me at peace with the world and happy. Read them and find happiness.